If you are new here, welcome! Let me introduce myself. My name is Rosemarie Griffin. I am a speech language pathologist and a board certified behavior analyst. I work in both a public school and a private school for students with autism and other complex communication disorders. Being able to use my background in both fields, has allowed me to help my students find their voice and increase their communication skills! I will never forget working with a student who was 8 and had no way to communicate. The student communicated with using problem behavior to get their needs and wants met across their day. Using both speech therapy and applied behavior analysis to help this student develop a way to communicate with the world has been such a joy! The road was not easy for this student, but working together as a team we helped this student find his voice! I have so many stories just like this and they make my heart feel so full! How lucky am I to be in a field where I get to help people communicate more effectively everyday! What a joy. At times it can be hard to understand how these 2 fields can be used together. 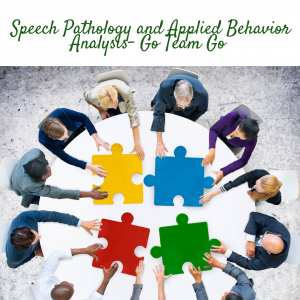 I created a webinar called Go team Go, which is about the fields of speech pathology and applied behavior analysis. It has information about both fields and strategies for how we can work together to help our clients. I know that this will not fix all of the woes that can come with collaborative services, but I hope that it starts a dialogue. Are you a BCBA and you have a question about speech pathology? Are you a speech pathologist and you have a question about aba? Watch the webinar below and if you have any other questions, don’t hesitate to contact me at rose@abaspeech.org.